One of our favourite events of the year is undoubtedly our attendance at the Whickham School Transition Awards evening. 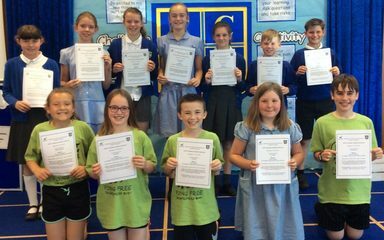 Nominated children from Years 5 and 6 from all local Whickham primary schools come together to share in the successes of children who demonstrate one of the characteristics of the 7 Olympic and Paralympic values: Respect, Inspiration, Excellence, Equality; Friendship; Courage and Determination. Imagine how difficult it is to choose just 14 children from our 2 classes of 30 – so many of them demonstrate all of these values routinely. Our winners proudly received their certificates from Whickam School staff, watched by family members and Fellside teachers. 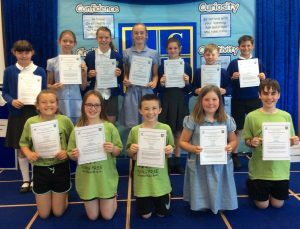 On Friday, the whole school shared in the success of the children when they received a second certificate of congratulations from Fellside too. Well done to all of our worthy winners. My thanks also to the members of our school choir who bravely took to the stage as part of the entertainment for the event. Their performance of the school anthem, ‘Earth Song’ was as lovely as ever.